If you choose Double Cuff style the Pant Lenght measurement that you measure has to be very accurate as double cuff styles the Lenght of Pants can not be adjusted,for new customers we suggest regular cuffs as it is very easy to adjust with your tailor locally. If you have an important formal event coming up, pay a quick visit to iTailorread more to find the finest quality custom tailored suit. We pride ourselves on our rich 40-year long tailoring history that has seen us reach the very top of the fashion industry. With exclusive monogram options, a multitude of colourful fabric choices, over 30 luxurious lining selections and a number of button colours and contrasting threads, the suit makers at iTailor can create works of art. Our team works around the clock to provide you with top-notch custom tailor suits for all the special occasions in your life. You can rest assured that any suit you purchase from us will be a head turner, and that you will be the star of the evening. iTailor is the most reliable online tailor you will find. Contact us today with your suit design idea and start preparing for your next formal event. Suit up! 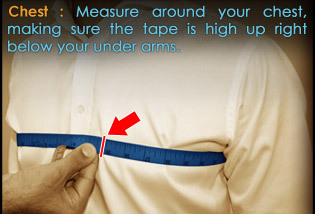 Part of the tailor-made experience is getting yourself measured up.With the assistance of our easy-to-follow video measuring guide, get yourself measured up in no time! Standard sizes provide an equally amazing fit. Select from an array of sizes from our standard size chart.Enjoy your Tailor-made product with the perfect combination of the right size and your creative style choices! The 'Save Design' option is available on the Checkout page. Please add your order to the shopping cart to Save a Design. *The Measurements shown is garment size not body size. 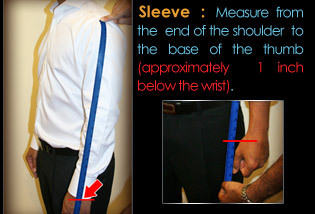 This is the Measurements from the suit itself (it includes ease / addition already)"
Your are able to adjust Sleeve Length. Length and Waist for Perfect fit!